Orange and black coloration warn would-be predators that this beetle may be a nasty-meal. During Captain James Cook’s first voyage to Australia his ship, Endeavor, became trapped within the shoals of the Great Barrier Reef off the northeastern coast of Australia. High atop Cook's Look beautiful blossoms, leaves, and stems of wild orchids serve as food for this leaf beetle. Cook landed at a reptile infested island known to the local Aborigines as Jiigurru. While ashore, Cook encountered so many large goannas he christened the islet, Lizard Island. To chart a passage through the reef and back to the Coral Sea, Cook and his party scaled a 359 meter peak known today as Cook’s Look. Recently, Bug of the Week traveled to Cook’s Look with a gaggle of undergraduate students from the University of Maryland to visit one of Australia’s most beautiful insects, the Dendrobium beetle. Growing wild along the steep mountain trail are large clusters of magnificent orchids, the favorite food of the Dendrobium beetle. Larvae of the Dendrobium beetle secrete strands of white waxy material to sculpt a fluffy pupal chamber. These brightly colored beetles consume the flowers, leaves, and shoots of many types of orchids including Dendrobium, Cymbidium, Cattleya, and Diuris. Eggs deposited in leaf axils by female beetles hatch into small orange larvae that rapaciously consume leaves, stems, and flowers. Their tiny mouthparts scrape away tender leaf tissue, leaving behind only the course midveins, creating a type of injury known as skeletonization. After a period of juvenile gluttony when their body weight increases several fold, the fully developed larvae secrete thin tubular strands of a Styrofoam-like material and form them into a pupal chamber. Maryland students show their might atop Cook's Look, off the coast of Australia. Within these protective redoubts, larvae transform into pupae. 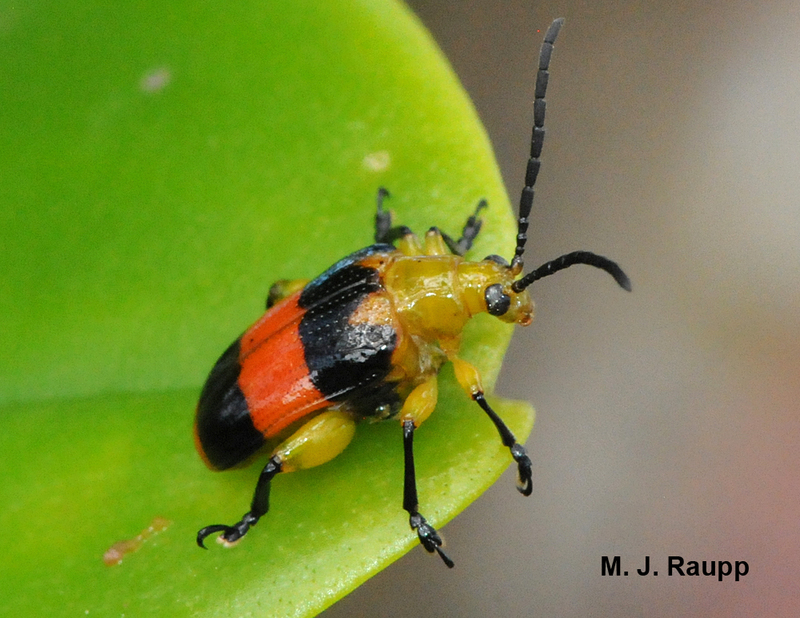 Like the orange and black monarch butterfly we met in a previous episode of Bug of the Week, the dazzling orange and black wing covers of the Dendrobium beetle likely serve as a warning to potential predators that this beetle tastes bad. One authority noted the beetle’s ability to produce a nasty defensive secretion from its mouth while emitting an irritating sound by rubbing together two parts of its body. Perhaps these clever defenses are the reason for the Dendrobium beetle’s success and why it is also becomes a pest for orchid growers in the land down under. Bug of the Week thanks the students and faculty of BSCI 279A, Natural History, Ecology, and Geology of Australia, for providing the inspiration for this story. The fascinating account “Review of the biology and host plants of Dendrobium beetle, Stethopacys formosa Baly (Coleoptera: Chrysomelidae: Criocerinae) from Australia” by T.J. Hawkswood was used as a reference.